Sleek, stylish and sophisticated in design. Available in two lightly scented flavours: Silky Shea and Creamy Coconut. Softlips LUXE is uniquely formulated with a Lip Perfecting Technology that blends 5 lip loving benefits into 1 to provide beautiful, luscious looking lips. Softlips LUXE provided my lips with a creamy, smooth, hydrated lip, as well, it had a slight cooling tingle that left it feeling refreshed. The lip balm wasn't sticky, in fact, it settled into my lips and kept it feeling smooth on the outside, moisturized on the inside. My lips remained moisturized for a while - there was no need for constant reapplication. Both the Silky Shea and Creamy Coconut have a very light scent respectively. There is still a hint of scent if inhaled extensively but other than that, it's practically scentless and tasteless. 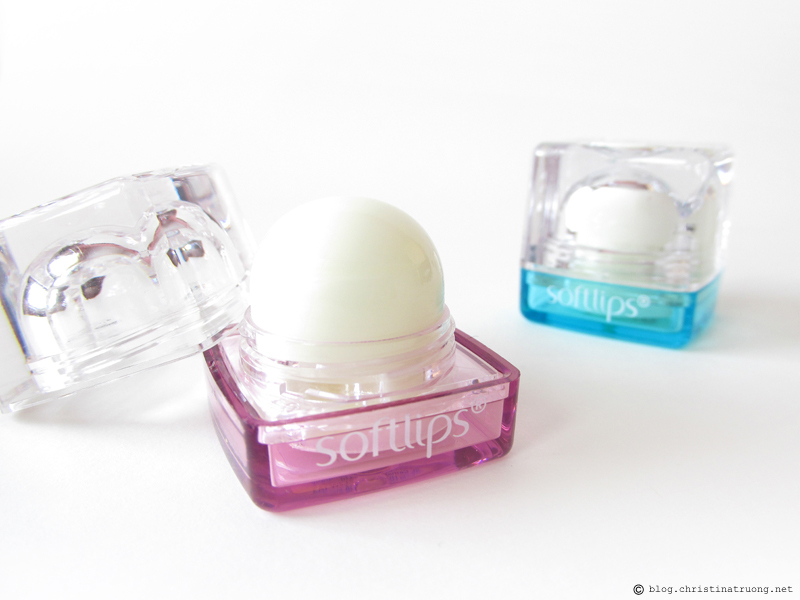 For those who are not a fan of scented or flavoured lip balms, Softlips LUXE are the way to go! A revolutionary 5-in-1 lip care that combines function and style in a sleek, glass-like cube design. Available in four flavours: Fresh Mint, Berry Bliss, Vanilla Bean, and Peach Mango. Uniquely formulated with Lip Perfecting Technology, Softlips Cube blends 5 lip loving benefits into 1! Every glide makes lips feel soft, smooth, hydrated and protected, while adding a light touch of shine. Softlips CUBE is similar to LUXE as it left my lips hydrated, smooth and moisturized. It also provided a refresh cooling tingle to the lips. The lip balm did not leave any tacky or stickiness to the lips, it actually absorbed into the lips once applied. So for those who don't like having hair stuck onto your lips, we have a winner! Berry Bliss has a sweet fruit berry scent and taste while Fresh Mint has a self-explanatory minty scent, almost like a peppermint gum but no taste. Although both lip balms have a scent, it does not linger on the lips. Both Softlips LUXE and CUBE work amazing! Both lip balms provide the same outcome; hydrated, moisturized, soothes lips. It also provides shine but not the glossy or greasy shine - the shine that makes lips look more radiant. In the end, it's a matter of preference of packaging and scent. If applying lip balm with a lipstick precision applicator and prefer a scentless lip balm, go for Softlips LUXE. If a lightly scented lip balm and a small cubed packaging are what's best, Softlips CUBE is your answer. If you're in search for a lip balm, Softlips are definitely the way to go.